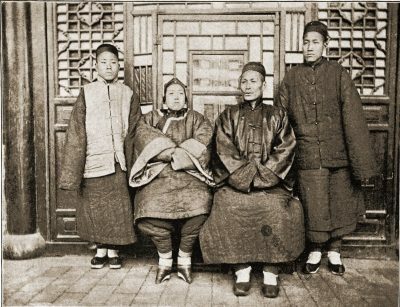 Chinese wife with bound feet, 1891. Home » Chinese wife with bound feet, 1891. A Middle Class Family. The Wife having Bound Feet. Titel: A Middle Class Family. The Wife having Bound Feet. Source: The Chinese, their present and future: medical, political and social by Robert Coltman. Publisher: F. A. Davis, Philadelphia 1891. Robert Coltman (1862 – November 3, 1931), American physician. Professor of anatomy at the Tung Wen College, Peking. Professor of surgery at the Imperial University, Peking. Personal physician to the Chinese royal household. Correspondent for the Chicago Record. This entry was posted in 1891, 19th Century, Asia, China and tagged China scenery on 3/7/18 by world4.